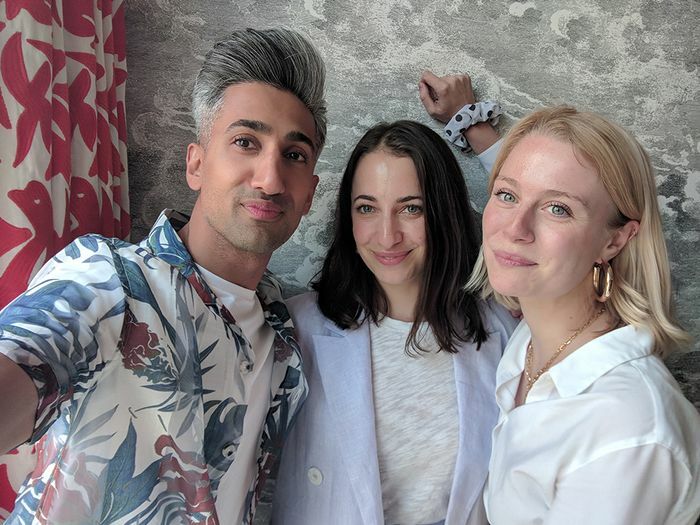 Tan France with Hannah and Isabel from the Who What Wear UK team. One man has captured our hearts this year with his style nous, impeccable hair, northern charm and ridiculously handsome selfies: Tan France. Queer Eye's resident fashion guru is responsible for a number of impressive wardrobe feats, including talking every man we know into wearing a shirt layered over a T-shirt. ("[Women] have so many options, and we don't … I'm trying to be as creative with the basics as possible," Tan tells us.) So when the chance came to meet the British TV star, we jumped. The second series of Queer Eye lands on Netflix on June 15 (earlier than planned, for all you super-fans chomping at the bit), and the boys were in London to promote it. Like you, we love Jonathan's swishy hair and Karamo's deep talk, but we were especially keen to log some one-on-one time with the Doncaster-born Tan. And the fashion designer-turned-style guru didn't disappoint: Running a few minutes late because he had to track down a Gregg's pasty (our kind of guy—all was forgiven) and looking utterly resplendent in a tropical shirt (layered over a tee, obvs), Tan kindly answered some important fashion questions for us. In fact, the questions may even be the ones you have long been asking—we asked Mr. France to give his opinion on Google's most-searched-for fashion questions. Did he have solutions for them all? Yes. Did we adore him even more than when we first started watching QE? Yes. Does anyone in America understand his accent? No—so he wears a bracelet with his name on it, as everyone thinks he's called Todd. Does he think we're all going to cry heaps during the second season? YES; apparently this one is an even bigger emotional journey, and we can't wait. To tide yourself over until then, get a slice of Tan's fashion wisdom below. QUESTION: How do you cut the sleeves off a shirt? "It depends what kind of look you're looking for. I always go along the sleeve the actual seam, and then if that's not enough, I fold over my garment and cut to make sure it's symmetrical. Here's the thing: I cut the sleeves of my shirts towards the summer. If I've had an old T-shirt that I loved but I don't want to have as much coverage, I cut off my sleeves, and I do that with vintage T-shirts usually. Who doesn't want to show off their arms? … I think men want to show off their arms in the summer, especially if they've been to the gym. And it's hard to find a good tank, so you go for the T-shirt that you love, and you cut the sleeves off—that's my thing." QUESTION: How do I start modelling? "Get on Instagram and start taking pictures of yourself. Start getting your friends to take pictures of you. Learn your angles, find your light and get those Instagram pictures going. I'm sure there's a better way, like signing with an agency, but who needs an agency when you've got Instagram? That's how I'd do it. Guys are found on there, too, Hannah! Something tells me there are a lot more guys on Instagram trying to be models than women. Every gay guy I know is trying to be an Insta model; the gays are taking over the world." QUESTION: What is haute couture? "Haute couture is a custom-fitted or custom-created piece of clothing—often a dress—that's hand-sewn. And to call yourself an haute couture house, you have to be… it has to be defined by a certain council and approved by a certain council." QUESTION: How do you wear booties with skinny jeans? "Go for cropped jeans. I don't love long jeans tucked inside boots—I don't think it looks great. Go for booties that are ankle height; any longer and it'll make your legs look shorter and wider. If you want to lengthen your legs, go for one colour; if you've got super-long legs, you can get away with a bit of ankle showing or a bit of calf showing and then to have your bootie, but yeah, I like going all-black—it'll elongate your legs—or all-white. I do like white booties, especially for the spring." QUESTION: How can you get get ink/wax/lipstick/chewing gum out of clothes? "Here's my tip for getting chewing gum out of clothes. It usually works with denim and tees (but it doesn't work with knitwear unfortunately): Freeze it and crack it out. That's the best way. I've actually got a tip for wax. If you get wax in your clothing—again, this doesn't work for knitwear, but it works for denim—you blow-dry it and make it as hot as possible, and then get a bi-carb and rub it in." QUESTION: How do you iron silk? "It’s actually really simple. It’s not about the heat, it’s about the steam. So keep the iron setting super super low. You can put your iron directly on the silk but you want to turn it inside out, and that’s how you iron silk." QUESTION: What is boho? How can I dress like a hippie? 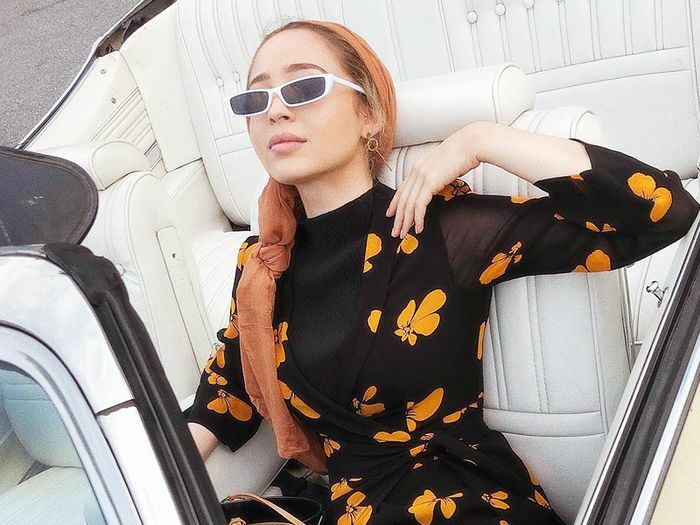 "Boho is super-carefree fashion; it’s usually lighter-weight fabrics; it's usually relatively neutral, and there's often a print—some kind of tribal print or earthy tones. You can achieve by going to a flea market; that's where you're going to find your look. Easy. How to dress like a hippie? You can go to a regular high-street store, but it's going to cost you a fortune—why go there? I'd go to a thrift store or a vintage store, and find pieces that are actually '70s but don't look like a costume. Team it with more contemporary pieces." QUESTION: What did people wear in the '90s? 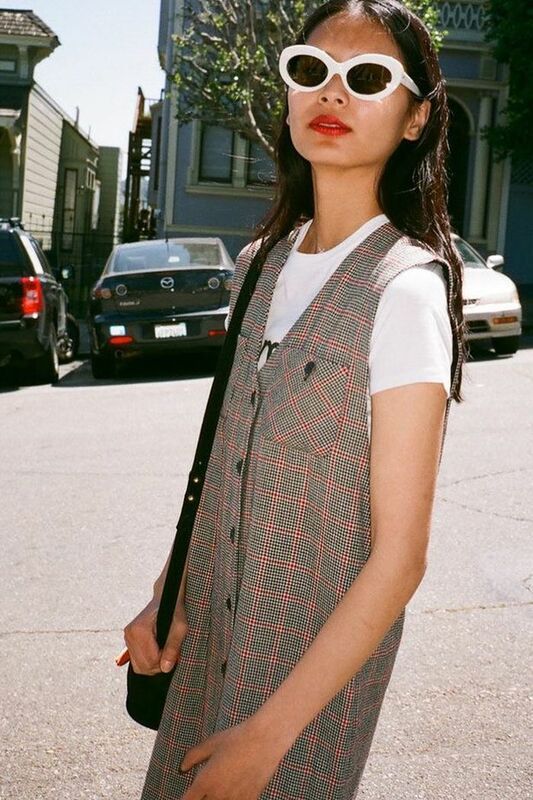 "I love that the '90s are making a comeback. What people were wearing was bumbags, big high-waisted jeans, mom jeans—I love mom jeans—go for mom jeans and you've got the '90s look." QUESTION: How do you stretch a T-shirt? "This is how you stretch a T-shirt. You're not going to do it when it's completely dry—you need to steam it. You've got your iron; put it on a high-steam setting, and pull it as you're steaming it. Do a section, pull it, do a section, steam it, do a section, pull it, do a section, steam it. It's simple. The reason I want to stretch a T-shirt is that sometimes when you buy a T-shirt—and it could be a lot of money or it could be an inexpensive one—jersey tends to shrink when you wash it, especially if you put in a dryer. "I always want the original shape; I bought it because I liked the fit of it on me in the fitting room, so once I've washed it, I'll steam it and stretch it so it still has that original fit. And you can take a T-shirt from a size small to medium by doing that. And sometimes it's the last one that's available in the store, and I just really want it, so I think, Okay, well, I'll steam it at home. I'll make it my size. As long as it's got a lot of spandex, you can make it work." QUESTION: How do you shrink clothes? "This isn't an exact science because you can't really predict what's gonna happen here; however, if you want to shrink jeans or a T-shirt, wash them on a high temperature—the highest temperature possible—and put them in a dryer. That should shrink it; however, it may become too shrunk. There's no way of making it 100% what you want it to be. Can I add one more thing? If you want to shrink clothes, go for things like regular clothes (jeans and T-shirts). Don't try to shrink knitwear—it's going to go terribly wrong. You think you're going to get it to your size, but it's going to become a toddler's size." QUESTION #11: How to become a fashion designer?